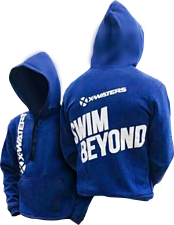 X-WATERS BAIKAL 2019 НАСЛАДИСЬ ГЛАВНЫМ ОЗЕРОМ ПЛАНЕТЫ! Enjoy the main lake of the planet! 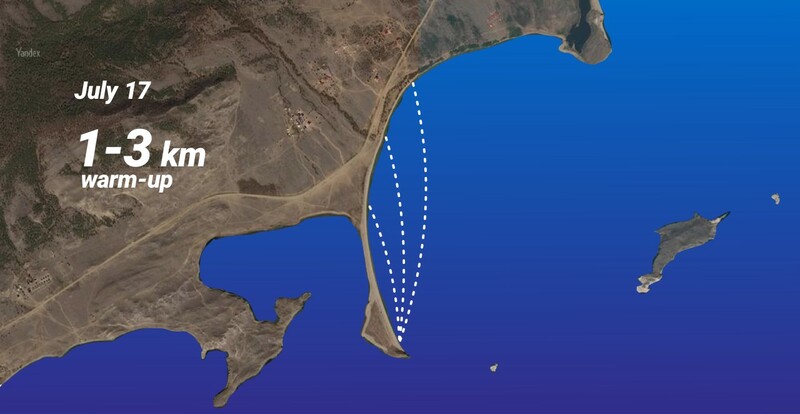 This year, the X-WATERS Baikal swim is held in the format of a six-day camp. You can also register separately for the Sunday swim, but... first look at what we have for you! - plenty of swimming in Baikal, every day comes with a new distance! - we will learn about Total Immersion Swimming technique (and improve it if you already know it) with the help of Alexander Bazanov, X-WATERS mastermind and TI certified trainer. It is also available for your co-travellers! 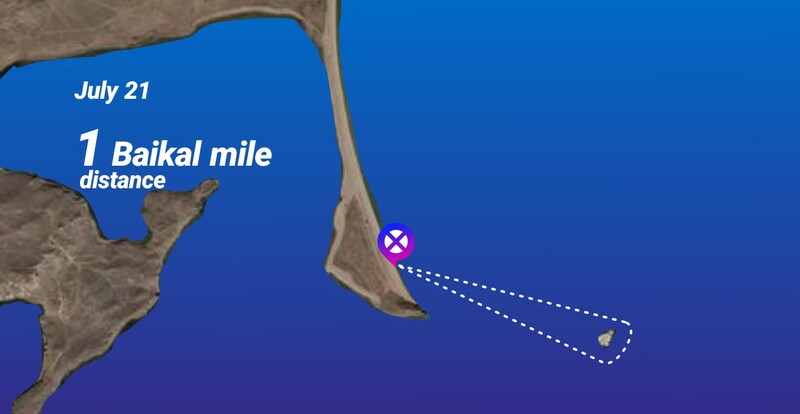 - On the sixth day, we will cross the Small Sea (or swim the Baikal mile), we will receive medals and celebrate victories in X-WATERS Baikal 2019 swim. The main thing: This is NOT a sports camp, where you will drop 5 seconds from your hundred. This is an‑ opportunity to enjoy the real nature reserve Baikal looking at it from water and land in an excellent company, simultaneously improving your swimming skills in open water. Important! The water in Baikal is cold, even in places which are relatively "warm". It can warm up to 22 degrees, but it can drop to 12 and below even in the warmest place. Predicting is impossible, you can only hope and get ready! Use Telegram app to chat with other participants https://t.me/xwaters_baikal (open from your phone when the app is installed). When it was born, 30 million years ago, it was possible to travel to Australia from Africa by land, and the forests in Antarctica were green. The Blue Eye of Siberia, the Sacred Sea, the Planet's Diamond are the names of Baikal. Baikal water is unique - there are very few mineral substances and organic impurities and a lot of oxygen. It is extremely transparent, visibility reaches dozens of meters. 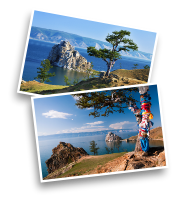 Kurma Bay, where the events of X-WATERS Baikal 2019‑ will take place, is a beautiful, almost untouched by civilization place in the Small Sea of Baikal. The bay is one of the warmest in the lake, the water here is usually a few degrees warmer than in the rest of Baikal. 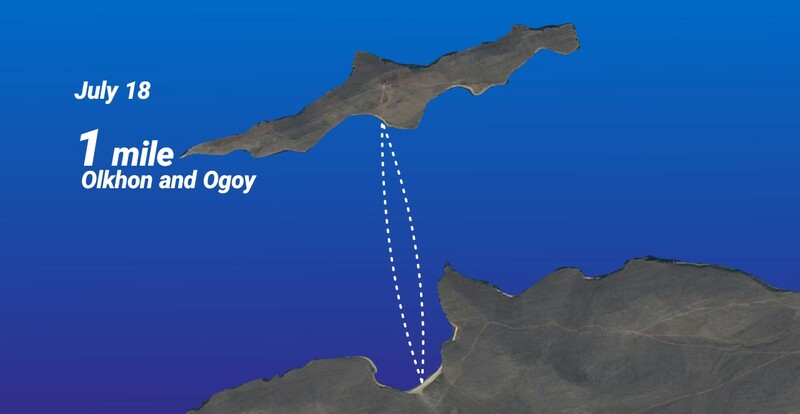 From the east, the Primorsky Ridge approaches the bay, from the South it is outlined by the Uyuga cape, stretched out by a two-kilometer-long pebble spit and crowned with an impressive rock, which offers a gorgeous view of Olkhon, Ogoy and several smaller islands, dotted with grottoes and populated by birds. This is the real Baikal! The closest option to the place of our swims, from the veranda where we will have lunch, you can see the finish. The rooms are not luxurious (they simply don’t have anything else here), but neat, all amenities are available. Good food in the cafe for very reasonable prices. July 16, Tuesday: Greetings to Baikal. - dinner & getting to know each other. - free time (for example, a photo walk along the surrounding hills). - return to the mainland. On this day, we will swim to three beautiful rocky islands, where only birds live, we will get out from water, enjoy and photograph each island. 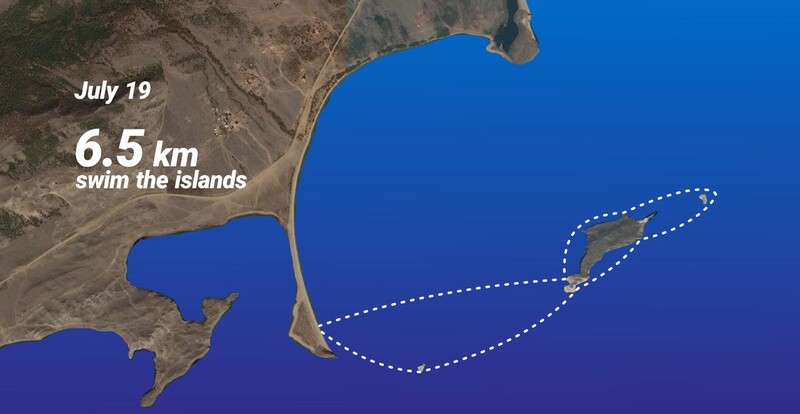 Total distance = 6.5 km (with 3 or 4 visits to the islands). - free time, rest, beach activities, camera hunt for gophers, etc. July 20, Saturday. Travel deep into Olkhon / free time. On this day, you can choose what to do and‑ go on a car tour of Olkhon (for extra fee), or relax, meet arriving swim participants, and go on a trekking tour around the Kurma Bay. - return to the mainland, checking the X-WATERS Baikal swim route 6 km. July 21, Sunday: big swim day! - 17:00 group departure to Irkutsk. - Registration for the swim on 21.07 for any distance or both. - Organization of swimming on 17-21.07. - Travel by boats from and to swimming spots. - Working out the swimming technique using the Total Immersion system. - Welcome dinner, field lunch at Olkhon, pasta party before the start, lunch after the finish. - Swimmers Party after the swim, award ceremony, authentic show program. - Medals, caps, individual safety buoys for the time of all swims. - Special set of unique branded souvenirs. - Accident insurance with coverage of 200 thousand rubles. - Flight, accommodation in Irkutsk. 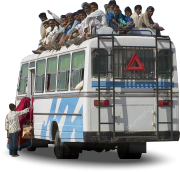 - Transfer from Irkutsk and back (please select separately). - Accommodation (please pay separately). - Olkhon Tour (please select separately). - Catering (except for the above). - Everything that is not listed in the "What's Included" section.